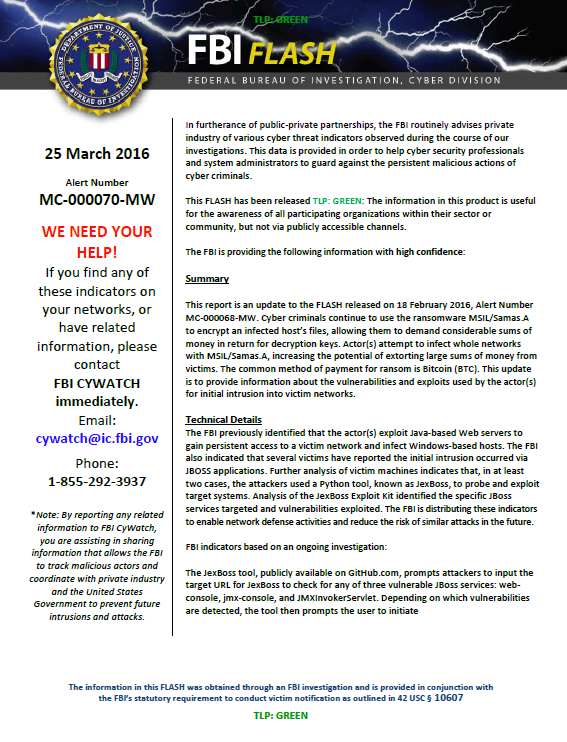 The following documents were obtained from the public website of a data security company. The JexBoss tool, publicly available on GitHub.com, prompts attackers to input the target URL for JexBoss to check for any of three vulnerable JBoss services: web-console, jmx-console, and JMXInvokerServlet. Depending on which vulnerabilities are detected, the tool then prompts the user to initiate corresponding exploits. The tool’s exploits are collectively effective against JBoss versions 4, 5, and 6. The payload of each exploit is a Web application Archive (.war) file, “jbossass.war”. A successful exploit results in unpackaging the .war file and utilizing jbossass.jsp to deploy an HTTP shell for the attacker. Following initial infection of the network with MSIL/Samas.A, the actor(s) connect via RDP sessions. An open source tool, known as reGeorg, is used to tunnel the RDP traffic over the established HTTP connection. The actors use the Microsoft tool csvde.exe to determine the hosts reporting to the active directory. A list of all hosts found in the directory is compiled into a .csv file or other similar file type. Finally, the actor(s) distribute the ransomware to each host in the network using a copy of Microsoft’s psexec.exe. • Ensure anti-virus software is up-to-date. • Implement a data back-up and recovery plan to maintain copies of sensitive or proprietary data in a separate and secure location. Backup copies of sensitive data should not be readily accessible from local networks. • Scrutinize links contained in e-mails, and do not open attachments included in unsolicited e-mails. • Only download software – especially free software – from sites you know and trust.